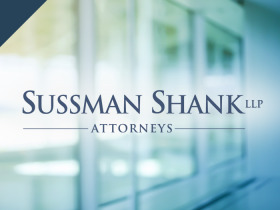 Sussman Shank's Appellate group handles appeals in a broad range of areas, including commercial litigation, employment, insurance coverage, and civil rights. Our appellate lawyers have appeared in the state appellate courts of Oregon, Washington, and California, as well as in the Ninth Circuit Court of Appeals and the District of Columbia Court of Appeals. Our group‘s experience, coupled with adept written and oral advocacy, allows us to frame and present the key legal issues in the most effective and persuasive manner possible. In addition to representing parties on appeal, our appellate lawyers can provide advice to trial counsel and their clients before and during trial to perfect and protect the record for any potential appeal. We represented members of a limited liability company in a claim by a member to dissolve the company. After prevailing in the trial court, the plaintiff appealed. We prevailed on the appeal, as well, based on a motion to dismiss the appeal. We represented a servicer that successfully defended a Fair Debt Collection Practices claim in the United States District Court. We also successfully represented the servicer when the plaintiff appealed, as the Ninth Circuit Court of Appeals affirmed the trial court's decision. We represented two co-trustees in a trust dispute with another co-trustee, concerning the sale of real property held by the trust. After succeeding in the trial court, the objecting co-trustee appealed. We represented the clients to a successful outcome in the Oregon Court of Appeals, which affirmed the trial court's judgment. We represented an insurance company in an insurance coverage dispute with an insured. Our representation of the client in the trial court and appellate court were both successes, as we prevailed in the United States District Court and prevailed again when the Ninth Circuit affirmed the District Court's ruling. We represented the respondent/defendant in an appeal of the trial court's granting of our motion dismissing the case. The plaintiff alleged breach of fiduciary duty, breach of contract, negligence, and sought over $1.8 million in damages. The issue on appeal was whether the trial court abused its discretion when it granted our Motion to Dismiss the Second Amended Complaint with prejudice. We represented a Washington homebuilder in a lawsuit filed against a real estate investor for breach of promissory note and the judicial foreclosure of the trust deed that secured the note. The defendant investor attempted to avoid liability for his obligations by asserting Washington Consumer Protection Act counterclaims against our client. At the trial court, we prevailed on a motion for summary judgment granting the client's claims against the investor and defeating the investor's Consumer Protection Act counterclaims. The investor appealed the trial court's rulings. On the appeal, we decisively defeated the investor's complex Consumer Protection Act arguments and the Court of Appeals affirmed the trial court's rulings. We served as co-counsel for the appellant in a case of first impression in Oregon. We sought the court's interpretation of the interplay between a lien claimant's entitlement to its attorney's fees and costs under the statute versus the reasonableness of those fees and costs pursuant to ORCP 68.